US$ 5420 / person ? 1 Arrival to Paro Morning arrival to Paro. Visit of Paro dzong, National Museum and town. Program subject to time of arrival. 2 Paro, excursion to Thimphu Early in the morning we will drive to Thimphu. Hike to Dodedra shedra. Start at Dechencholing part of Thimphu and gently climb some 500 meters up, with beautiful views of Thimphu town. Dodedra is monastery school set in pristine environment away from the hustle and bustle of the town. Visit main temple with original mural paintings and small museum. Descend back to Thimphu for lunch. Then drive to Buddha Dordenma, the gigantic statue of Buddha overlooking the valley and short walk to striking city viewpoint. See Memorial Chorten, always busy with devotees. Walk in Norzin lam street and see the traffic police signaling in junctions. Thimphu is only capital in the world without the traffic lights. Finish walk at handicraft market where many interesting Bhutanese souvenirs can be seen and bought for reasonable price. Evening visit of Tashicho dzong, the castle, which serves as seat of the king and government. Drive back to Paro in the evening. 3 Drive Paro – Gunitsawa Morning visit of Kyichu lhakhang, the temple built in 8th century by Tibetan king Songtsen Gampo. Climb to Taktsang gompa (Tiger's Nest), most venerated and holy place in Bhutan overlooking valley from the steep cliff. After lunch drive to Drukyel dzong. This used to be a place where the trek started before. See ruins of the old dzong (castle) and continue further to military camp of Gunitsawa on the new built road. Possibility to make detour to Lhadi Gompa just before military camp. First night camping just above military camp at the elevation of 2,890 m.
4 Trek Gunitsawa – Thangthangkha Distance 16 km, 7-8 hours, 770 m ascent, 10 m descent, camp altitude 3,610 m. On this long day there is a lot of up and downs. After going uphill around the river, the valley finally narrows to a mere path which descends to a meadow where a camp will be set up. From here, if weather permits, you will have the first great view of Jomolhari. 5 Trek Thangthangkha – Jangothang Distance 10 km, 5-6 hours, 480 m ascent, camp altitude 4,080 m. If you did not see Mt. Jomolhari the previous evening, you will still have a chance to get a great view early this morning. The trek continues up the Paro Chhu valley which widens into patches of alpine meadow and scanty growths of forest. You will cross an army checkpoint along the way and enjoy a spectacular view of high mountain ridges and snow-capped peaks. In this area yaks and their herder’s homes become a regular feature of the landscape. Passing the villages Soe, Takethang and Dangochang is another asset on this day. After reaching Jangothang, one of the most beautiful campsites of the Himalayas, you will again have a spectacular view of Jomolhari. 6 Halt in Jangothang Today we will make beautiful acclimatization hike to Tshophu lakes in 4450m altitude. From above the lakes you can see the aerial view of Jomolhari I, Jomolhari II, and Jichu Drakye summits. Herds of blue sheep are also common sight. If you are strong, you can even continue to Bonte-la pass (4850m). After enjoying by the lakes, descend back to Jangothang and have a good rest. 7 Trek Jangothang – Lingshi Distance 13 km, 6-7 hours, 840 m ascent, 870 m descent, camp altitude 4,010 m. A short distance from the camp the trail begins climbing rapidly for about half an hour and then becomes a gradual ascent to the Nyilila pass at 4,870m. While on the climb enjoy the surroundings. You might see herds of blue sheep grazing on the slopes of the mountains. From the pass you will have spectacular views of Mt. Jomolhari, Jichu Drake and Tsherimgang, all of them rising above 7,000m. It's a gradual descent to the camp where you will pass by some of the yak herder’s tents, made from yak wool. The herders use these tents while travelling tovarious pastures for their yaks. As you come down into the Lingshi basin, a beautiful U-shaped valley, you get a wonderful view of Lingshi Dzong on clear days. Tserimgang and its glaciers rise up at the north end of the valley. The campsite is next to a stone hut you reach just before Lingshi Dzong. 8 Trek Lingshi – Chebisa Distance 10 km, 4-5 hours, 280 m ascent, 410 m descent, camp altitude 3,880 m. Today is the very short walking day so if you fee strong enough, you can make morning side trip north of the camp the lake Chhokam Tsho at 4340m near the Jichu Drakye base camp. Side trip will add about 8 kilometers and 450m both up and down and will take about 3 hours. Otherwise start walking from camp and to a junction by the white chorten. Here, you have the choice of staying on the main trail or taking a detour up to the Lingshi Dzong (4,220m), which sits right atop a high ridge. In addition to a very special atmosphere of mystic tranquillity, Lingshi Dzong provides a great view over the valley. After Lingshi Dzong you will be passing the villages of Lingshi and Goyul. In Goyul, the stone houses are clustered together to form a small compact village that is unusual in Bhutan where settlements are usually scattered. On reaching the campsite at Chebisa you will have plenty of time to visit the village houses if you feel up to it. There is also a beautiful waterfall located behind the village that is worth visiting. 9 Trek Chebisa – Shomuthang Distance 17 km, 6 hours, 950 m ascent, 640 m descent, camp altitude 4,220 m. The morning starts with a long ascent behind Chebisa Village (2-3 hours) through a wide pastureland towards Gobu La (pass). On the way, you will see a few people herding yaks. There is also a great chance to spot large herds of blue sheep above the trail. After crossing Gobu La (4,410m), you descend into the valley, then climb again a little bit, before descending again to Shakshepasa (3,980), a large flat valley. This place is possible campsite, but we better continue with some extra climb to Shomuthang (4.220m), which will give us better start for next days pass. 10 Trek Shomuthang – Robluthang Distance 11 km, 4-5 hours, 500 m ascent, 760 m descent, camp altitude 4,160 m. You begin by climbing up the valley to view Kang Bum (6,526 m) and some edelweiss. After three hours of climbing you will reach Jhari La (4,750m), from where you catch the first glimpse of Sinche La, the pass you will have to cross the day after. The big snow peak in the north is Gangchhenta 6,840 m, better known as the Great Tiger Mountain. If weather is clear, Tserim Kang and the top of Jomolhari will be visible. As the day trek is short, you might like to make climb to Jhari Peak adjacent to the pass in elevation of 4935m for better views. Round trip will take you little bit over one hour extra. Descend to the camp by the river which is called Tsheri Jathang, located in a beautiful wide valley. Herds of takin, the Bhutanese National Animal, migrate to this valley in summer and remain for about four months. The valley has been declared a takin sanctuary. Climb up a little bit and you will finally reach the campsite at Robluthang on a rocky meadow. 11 Trek Robluthang – Limithang Distance 13 km, 6-7 hours, 850 m ascent, 870 m descent, camp altitude 4,140 m. The trek starts out with an initial 40-60mins ascent before gradually raising for another 1½ hours through a boulder field. It is then a 1 hour steep ascent before reaching Sinche La (5,005m) – the final and highest pass on the trek if you don’t intend to continue the Snowman trek from Laya onwards. As you descend the far side of the pass you will see an impressive terminal moraine and a glacial lake at the foot of the valley. You can see classic examples of lateral moraines where the glacier has pushed rocks up both sides of the valley. Below the moraine, you cross the Kango Chhu and soon reach the Limithang campsite. The peak of Gangchhenta towers over the campsite even though it’s quite a distance away. 12 Trek Limithang – Laya Distance 10 km, 4-5 hours, 60 m ascent, 350 m descent, camp altitude 3,840 m. Today, you walk downhill all the way along a narrow, winding river valley. After a quote few days, the trail takes you through densely forested region finally reaching the west side of Laya village from where you will have spectacular views of Mt. Gangchhenta and Mt. Masagang. In the village centre is a community school and a basic health. The campsite is located below the school. Explore around village and visit of the traditional local farmhouse. Laya women wear original conical bamboo hats decorated with turquoise and silver ornaments. In the evening you can also taste local spirit called “ara”. 13 Trek Laya – Rhoduphu Distance 19km, 7-8 hours, 1,030m ascent, 750m descent, camp altitude 4,160m. From Laya we descend to an army camp and continue following the river till the turn off point to Rhoduphu. After lunch the climb continues through rhododendron bushes till you reach the camp at Roduphu just next to the Rhodu Chhu. 14 Trek Rhodophu – Narethang Distance 17km, 7-8 hours, 740m ascent, camp altitude 4,900m. After following the river for about half an hour you will have a steady climb to a high open valley at 4,600m and then further up to Tsomo La (4,900m). 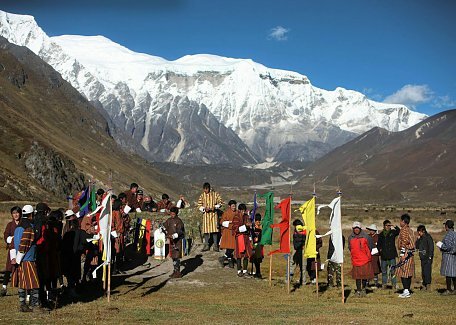 Tsomo La offers a superb view of Lunana, Mount Jomolhari and Jichu Drake, and the Tibetan border. The route then crosses a flat, barren plateau at about 5,000m. The campsite at Narethang is towered by the peak of Gangla Karchung (6,395m). 15 Trek Narethang – Dead Man’s Camp Distance 21km, 6-7 hours, 300m ascent, 1,200m descent, camp altitude 3,970m. From the camp you will climb for about an hour to Gangla Karchung La (5,120m). The view from the pass is breathtaking and the whole range of mountains including Jekangphu Gang (7,100m), Tsenda Kang and Teri Gang (7,300m) can be seen. The pass descends along a large moraine. Again one has great views: a massive glacier descends from Teri Kang to a deep turquoise lake at its foot. Up here a glacial lake burst through its dam in the early 1960s, causing widespread damage and partially destroying Punakha Dzong. Finally, it is a very long descent through thick rhododendron to Tarina valley, where you will find several good campsites along the Tang Chhu. Anyway as this day is not particularly long, you will continue about 1 hour further to large boulder for camping. This place is called “Dead Man’s Camp” by the Bhutanese staff because the tourist did die on this place due to high altitude sickness. You should ba having good acclimatization though, so have no worry. Your Bhutanese staff might be afraid of ghost though! 16 Trek Dead Man’s Camp – Woche Chhu Distance 15km, 4-5 hours, 240m ascent, 330m descent, camp altitude 3,910m. The walk leads down through conifer forests following the upper ridges of the Pho Chhu, passing some impressive waterfalls. The trail then climbs over a ridge and drops to Woche after about 2.5 hour walk. This is settlement of a few houses, the first village in the Lunana region. The trail leading south-west is the fastest way to reach Punakha valley and is used by locals when they need to go to “civilization”. Spend some time to explore the village or visit a local shop. Afternoon continue some 1.5 hour the campsite by the Woche Chhu river side. 17 Trek Woche Chhu – Lhedi Distance 16km, 7-8 hours, 980m ascent, 1,190m descent, camp altitude 3,700m. This will be quite hard and long day. The trek starts through juniper and fir forests, and further ahead, through rhododendron bushes. Climb up to Keche La pass (4,650m) where one can have the great view of surrounding mountains again. After the pass, descend to the riverside walking through a village with a stunning view of Table Mountain and others. Follow up the river till Lhedi Village. Lhedi has a basic health unit and a school. Camp by the village. 18 Trek Lhedi – Thanza Distance 14km, 6-7 hours, 450m ascent, camp altitude 4,150m. In clear weather, you will have great views of Table Mountain (7,100m). Around lunchtime you will pass the small village of Chozo (4,090m) which has a dzong still in use. Reaching Thanza again you will have a great view of Table Mountain which forms a 3,000m high wall of snow and ice behind the village. Although there are possibilities to camp directly at Thanza, most groups prefer to camp in Thoencha. 19 Halt in Thanza Rest day in Thanza. You can either get well deserved rest after very difficult part of the trek of make about 1-2 hours hike to neighboring villages. Other option is the viewpoint in 4800m with the views of the surrounding mountains. Thanza has mobile phone network and even the data connection so you can check your e-mails and update social networks. 20 Trek Thanza – Tshorim 8-9 hours, camp altitude 5,240m. Having chosen the route to Bumthang the trek starts by climbing a ridge with a great view of Table Mountain and Thanza valley below. The ridge altitude is 4,500m and it rises gradually up to 4,650m. After lunch, walk upwards towards the left side of the bridge to enjoy the view of snow-capped mountains. You reach the campsite of Tshorim after climbing more ridges. This the highest campsite of the trek. 21 Trek Tshorim – Saram 6-7 hours, camp altitude 4,970m. This is one of the highlights of the trek and the day starts with a short climb to the Tshorim Tsho lake, one of the most spectacular mountain lakes of Bhutan. You walk on the side of the lake enjoying a panoramic view of the Gophu La ranges. The last climb to the Gophu La pass (5,455m) is not long.. After the pass descend to the campsite, walking along the ridge to enjoy a great view of Gangkhar Puensum. If interested, one can divert to the left side to climb up the pyramid peak for a better view or you can go down to the camp nearby Sha Chhu. 22 Saram – Warathang 6-7 hours, camp altitude 4,500m. The trail further follows the Sha Chhu and descends gradually to Minchungang (4200m). Here the very steep climb starts which will take you Phrodhrang La pass (4660m). Below that, there is high campsite called Phrodhrang, which used by parties trekking in opposite way. Continue descending until you start again climbing to Sake La pass (4950m) reaching to summit approximately 2 hours after first pass. From here it’s about one hour to descend to Warathang (4520m). 23 Trek Warathang – Duer Tsachu 4-5 hours, camp altitude 3,350m. Day starts with the short climb to Urathagn la (4,600m). After the pass, you have to undertak long and uncomfortable descend to the riverside through dense rhododendron, juniper and conifer forest. After the bridge a short climb leads to Duer Tsachu. These hot springs, where Guru Padmasambhava is supposed to have taken bath, might be the most stunningly beautiful hot springs of the Himalayas. You will be enjoy the afternoon bath to clean the sweat of previous days! 24 Trek Duer Tsachu – Tshochenchen 8-9 hours, 15km, 1500m ascent, 700m descent, camp altitude 4,150m. Refreshed in hot springs, you begin last major climb of the trek. Mixed forest is changing to juniper one. It will take about 3-4 hours to reach the Gokthong-la pass (4420m). Descend below the pass and have a lunch. After that, you will need to undertake 1.5 hour climb the Juli La pass (4700m). This is good time to small celebration as it’s the last pass of the trek! Finally descend to the beautiful Tshochenchen campsite by the small stream. 25 Trek Tshochenchen – Gorsum 6-7 hours, camp altitude 3200m. 100m ascent, 950m descent. Follow the stream all day, reaching to mixed forest of junipers and rhododendrons. Last camp at Gorsum after last serous trekking day. 26 Trek Gorsum – Duer, drive to Jakar 3 hours, 700m descent. Continue descending through mixed pine forest until you reach road head at Dur village. Here the bus will be waiting you! Enjoy the refreshments, and tell proper goodbye to your trekking staff. Then drive to Jakar and accommodate in the hotel after 24 days trekking! 27 Rest in Jakar Enjoying the end of trek in beautiful valley of Bumthang. Easy sightseeing around and visiting temples like Jambey, Lhakhang, Kurjey and Tamshing. Visit to Red Panda brewery with beer tasting. Explore lively little town of Jakar. 28 Jakar – Wangdue In the early morning start drive back to the west. First reach to Chummey where you can stop for traditional textile shopping. After crossing Yotung-la pass (3400m) descend to Trongsa. Here you will visit one of the largest castles, called dzong, in Bhutan. From here, the royal family of Bhutan had risen. Continue long drive on windy road with short stop at Chenebji stupa, which is designed after Bouddhanath stupa of Kathmandu. Reach to Pele-la pass (3450m) which is the border of central and western Bhutan. Finally descend to subtropical Wangdue valley, reaching there by the evening. 29 Wangdue – Paro Morning climb to Khamsum monastery with wonderful view of the valley and it‘s terraced paddy fields. See the longest suspension bridge in Bhutan stretching the length of 350m over Pho Chhu river. Visit of Punakha dzong, which counts as the most intricately decorated castle in the kingdom. Short walk to Chhimmy lhakhang temple, devoted to 15th century saint Drukpa Kunley, know as “Divine madman”, who did taught Buddhism by singing, drinking and rampant sexual behavior. If time permits, also visit Sangchhen Dorji Lhuendrup Lhakhang nunnery with Bhutanese and Nepali style stupa, overlooking the valley from the high hill. Afternoon drive to Thimphu. Walk in town and enjoy the last day in Bhutan. 30 Departure from Bhutan Drop to Paro airport and departure from Bhutan. Start in Gasa and shorten the tour to 23 days: If you are really strong you can also start the trek in Gasa, instead of Paro. See Snowman trek from Gasa for details.